La Sportiva made some noise in the trail running world when they released the lightweight, high performance La Sportiva Vertical K (review). Since then, the Vertical K has been very popular for shorter runs and races, but the minimal package had some runners looking elsewhere for a daily trainer or ultrarunning shoe. La Sportiva responded with the release of the Helios. The Vertical K’s influence on the Helios is apparent with the similar outsole, same basic midsole shape, and a 4mm drop. With the addition of 1.5 ounces, the La Sportiva Helios ($120) diverges from the Vertical K with a wider footprint, the addition of a 2mm LaSpeva plate for additional protection and support, and a more built-up upper. The most noticeable aspect of the upper when first putting on the shoes was the heel stabilizer. I was skeptical about this at first, but found it did a good job of keeping my heel in place without being too restricting. The rest of the upper is composed of mesh, which did a nice job with drainage and keeping out debris. I ran through a few puddles in the shoe and never dealt with too much water retention. The shoe has a gusseted tongue that I found very comfortable. One strange aspect of the tongue was the thick cushioning present. It never posed any issues on runs, but I didn’t find it to provide any benefit either. The upper is locked down with a TPU lacing system that is integrated into the shoe. The lacing system pulled the upper together and added some structure, as well. The laces could have been a little longer, as they came untied a few times on the trails when I was at a comfortable lace tension. The toe cap on the front performed just fine. I most often wore the Helios sock-less and never had any memorable chafing issues with the upper. The midsole of Helios was one of the most impressive aspects of the shoe. The midsole is composed of an EVA midsole with the addition of a 2mm LaSpeva plate. LaSpeva is described as a thicker, more-resilient foam that is supposed to add to the comfort and rebound of the midsole. The cushioning was right in the middle ground of shoes I’ve worn. It fit right in the range where I didn’t feel like I was losing energy on the trail or feel like I was going to sustain a stress fracture when I took them out on the roads. The shoe hit a middle ground on width, as well. It didn’t feel too wide or narrow in any part of the shoe. There is a small amount of arch support. The outsole is a unique design made up of La Sportiva’s FriXion AT material arranged along the edge of the shoe, and then alternating rubber and indents going from front to back. I’ve been able to test the Helios on a variety of trail conditions ranging from pavement, dirt, rocks, mud, snow, and ice. The grip has been fantastic across the board. The FriXion AT material really surprised me with how broad of a range of surfaces that it gripped well. Over the past few months I’ve been running in the Helios, I’ve found it to be a fantastic shoe for pretty much any trail running situation. La Sportiva really nailed it, making a shoe that combines performance and just enough structure for training and racing long. One of the only issues I had with the shoe was with some foot-swelling issues at about the marathon point on some muddy and icy trails. I wore the shoe between 15 to 20 miles plenty of times without issue, but it felt a lot tighter when I went longer. The size I’m wearing, 44.5, fits like a glove on me now, so if I get another pair for going past the marathon distance, I will probably go a half size larger to compensate for foot swelling. I’d highly recommend the Helios for anyone that’s looking for a minimal shoe with enough support for an ultra. 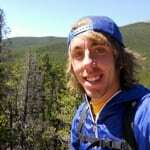 Ryan Lindemulder is iRunFar’s Spring 2013 Intern. Born and raised south of Chicago, Illinois, he ran cross country and track for 11 years and is now directing his passion into trail and ultrarunning. An English major in his senior year at Trinity Christian College, he looks forward to cultivating his running and writing skills. While spending most of his time on the trails near Chicago, Ryan has spent summers working and exploring in Nevada, Utah, and Colorado. Great review/preview. The features on the Helios sound great, 4mm drop and protection. Will have to give these a try this year. I'm glad to see that they don't have the Vertical K's stretch gaiter. Makes it crazy hard to get the right tension on your laces! Between that, the wider base and the additional protection, it's like they fixed everything I don't like about my Vertical K's! Last year I wore the vertical K and this year I've ran quite a bit in the Helios (up to 20 miles) and I would agree with everything in this review except that I have barely noticed any updates in underfoot protection. These shoes are comfortable, but they leave my feet feeling beat-up and swollen. Nice review. Looks like they did a great job of fixing the shortcomings of the VK's. Also cool that there is now another option for an "ultra distance" minimal type shoe – as opposed to a regular minimal shoe that can't go long on rough terrain. It´s a nice shoe but it isn´t – depending on what one understands under the term "minimal" – as little shoe as for example the NB MT110 or Inov-8 Flite 195. What isn´t necessarily a bad thing, just don´t expect the same lightness or groundfeel. For me, the Vertical K had far too much flexibility. It was fun to play around in, but was never a long distance option. Glad we both have an option now! My own take is that I ran my first two 50ks in Vertical Ks, and my first 50-miler in the Helios. I actually like the upper of the Vertical K better, but the mid sole of the Helios makes it a great shoe for runs beyond 20-25 miles. Both are awesome shoes. Does anyone have any feedback on these shoes compared to the Pearl Izumi e:Motion Trail N1's? I'm really digging the PI's, but have been intrigued by the Helios as well. I actually just picked up a pair of N1's two weeks ago, any specific questions? My PI N1 has ticked over 200 miles now and it does get more flexible. Keen to try the Helios at some point. Just did rim2rim2rim in the N1 and they performed really well. My only small complaint is they are a touch bulky…the Helios look to maybe have the edge in that regard. You'll definitely feel the Helios coming with more cushion out of the box. After two weeks the N1's have softened up but the Helios still feels like it has a touch more cushion. On a similar note, I thought the N1's were stiff at first but they've gotten more flexible for me like Mikez was saying. Both seem to be at pretty similar flexibility levels now. I'd say that you can feel a weight difference between the two but it hasn't been a dealbreaker for either shoe. Any other questions/clarifications let me know! I love the helios. They have a nice, wide toebox and feel light to me. Perfect for me in terms of heel drop. Can't wait to run a 50k in them next weekend. Great review and commentary. Thanks to all. Ryan, you noted they perform well on all surfaces, but I am wondering about what looks like large gaps in the outsole (red) with sizeable midsole (gray) showing through. How much protection is there from sharp rocks, roots, etc, that catch you in those exposed midsole sections? I have worn NB 1010s on all terrain for races up to 50m and have not found it to be an issue, but others have complained about a similar problem with that shoe. I have been wearing the Helios for a couple of months now and they are great. I have never had a problem with rocks or roots catching in the grooves. I think you'll really like the shoe! I've had a similar experience. Most of the trails I run are not particularly rocky but I haven't noticed any differences when I hit a rock on the gray area. Nice review Ryan. Each of your posts have gotten better and better! Thanks guys. I really appreciate the feedback! I run exclusively in NB MT110 on pretty technical singletrack and as my mileage increases on the weekends, I am starting to wonder if I need something like this shoe for my long runs (20+ miles) in the mountains. I am a pretty big guy (190 lbs) who transitioned this year to a mid/forefoot strike and really want to avoid ITBS again. Any thoughts or experience related to this appreciated. Peace! Helios @ ZAPPOS = $108.00. First short run in them today. Traction and protection are great. They *are* light but do not feel like a minimal shoe, with plenty of cushion which I hope will serve well on ultra length runs. Biggest concern is that, in spite of the greater width than previous LS offerings, they are still a bit narrow for my foot. Hope to take them for a longer outing this weekend and see how I fare. I cannot wear the Vertical K without superfeet black insoles: too flexible. With the insoles they are wonderful short distance mountain racers, with a very snug fit, and the insoles act as a rockplate. I do not wear insoles with the Helios, as they offer enough support and slightly more stiffness. Over time the midsole under the metatarsals loses it's cushion and you start noticing rocks more. I could wish for slightly more cushion in this midfoot area, and perhaps less in the rear (where I see little wear or compression), but these are wonderful desert-running shoes, and always a pleasure to put on. I've now had them out for several runs, including early today in a pouring rain on trails that were essentially streams with rocks and rootsand they performed great. Great traction and drain really well — no "glop glop" feeling even when soaked. Someone above had mentioned the Helios' lack of flexibility. Could this account for why I've got pain in the ball of my left foot, never a place I usually hurt? Strange because the cushion and protection are outstanding. This is probably more of a biomechanics question suited for Joe Uhan, but thought I'd throw it out here. I am definitely used to running in a more minimalist/flexible shoe, though have also logged lots of miles in a pair of Trailroc 255s with black Superfeet inside and have not had this issue. I am also interested in both the N1 and the Helios. Which one can handle technical terrain better – rocks, roots, etc – without constantly worrying about foot placement? Or are they both equal? I'd give a slight upper hand to the N1, there's a bit more protection in that shoe. is for "short distance off road tracks"
I think that's just because they are more minimal and low-drop than some of those other beasts they sell. Andy – did that pain in your foot go away? Did you continue to run in the Helios? I've run about 3.5 hours total in the shoe and also have noticed a strange pain in the ball of my left foot. The shoe feels great, so it's sort of perplexing. No it hasn't gone away, though I've continued to run in them (alternating with other shoes). I'm thinking perhaps the pain has lessened some, and hoping as they "break in" (which I've never had to do with other shoes) it will continue to ease. My longest run in them so far is probably 90 minutes. I think it's either lack of flex or placement (size?) of the arch support, which is probably a bit more than I'm used to. The shoe is also narrower than I'm used to, so I've compensated by sizing up a drop, which makes them a wee bit longer than my other shoes and maybe that's thrown the position of the arch off a bit. Really not sure, but somewhat disappointed as I'd really hoped they would be the shoe for long and very technical runs that tend to beat up my feet in more minimal shoes. I'm not super optimistic but gonna keep them in the rotation for now. Thanks Andy. My suspicion is that it does have something to do with the arch support. Sitting at home the shoe appears to fit my foot really well, so it must have something to do with how the foot bed acts under the torque/pressure of full body weight being applied through the gait cycle. Odd because my other foot feels fine. Quick follow-up: Took them on a 6:14 rocky run with about 5k climbing this past Saturday, and the ball of the foot was OK and overall the shoes were super comfy. No blisters, chafing, or any issues at all. Great combo of soft and light yet supportive and protective. Kinda like Hokas for the minimalist! Perhaps they have broken in or softened up, or I've just gotten used to them. Probably gonna try them for my next long (50 or 100m) race and see how I fare. How do they stand against the Trailoc 255s? How is the cushioning, foot protection and general foot comfort? Which one do you consider to deal better with hard packed and steep, rocky trails in the mountains. I currently run in Rogue Racers, which I like very much for their lightness and underfoot protection, but they are a little small (tight fit) and "break" my toes on long technical descents. I also need a bit more protection on very technical trails, in a shoe as light as possible, and I've spotted the Helios and Trailroc 255s for that. Forgot to mention, I run half marathon and marathon distance, not ultras and I've only ran in standard heel to toes drop shoes till now. Paul – TR 255's offer more protection underfoot. The Helios are a bit lighter and more "racey", but the 255's would handle steep, rocky mountain trails better in terms of protection. And they seem to have more room in the forefoot than the Helios. Agree with David on all counts. The Helios is definitely lighter and "springier," with less protection. Decided to run Vermont 100 in 2 weeks and will start out in the Helios and hope they go the distance, but will have the 255s and a couple alternatives in drop bags just in case. BTW, I think I figured out the ball of foot pain: It might have to do with the construction of the sole, which is essentially a series of lateral ridges, unlike most other shoes (255s included) which have a flatter topography. So body weight on footfall does not seem to distribute as evenly across the foot due to the ridge-like structure. Just my 2 cents! … and if you are transitioning from a standard 12 mm drop to a 4-6 mm drop start out slowly, watch your form, and give achilles, soleus, plantar fascia, etc. a chance to adjust. The lateral ridges are propably to save weight. Andy – after laying off the Helios for a couple of weeks, I did a 6hr mountain run in them Saturday and didn't have any more pain issues in the ball of my foot. I guess they just had to get broken in enough. Good luck at Vermont. I paced WS 100 in these from Foresthill to the finish. I loved them at the time, would have come on here and said this is the best shoe ever. I am alternating these with Montrail Fluidflex (love 'em!) and LS Wildcats (when I am speed hiking in rock and muddy terrain). I even bought an extra pair of Helios for an upcoming race, but now I am starting to wonder. I have never had knee pain – I have been running since I was a kid and tried a ton of shoes. Every run or speed workout I do not wearing these I experience no pain, but after any run in the Helios my knees are killing me. I don't want it to be the shoe – and it is quite possible it isn't the shoe… but I am just not sure. I think I will be sticking with the Montrails for now. hmmm. very interesting. I would say I will give them another 40 mile shot to see, but I am far too afraid to risk it.